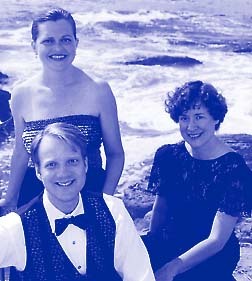 The Jamestown Chamber Music Series was created in 1999 by "Music for a While," and produced by the Flickers Arts Collaborative. The Series ran for six successful seasons. Partial funding was provided by the Jamestown Fund for the Performing Arts of the Rhode Island Foundation. Bank of Newport was a Corporate Benefactor. About "Music for a While"
"Music for a While" chamber ensemble -- acclaimed for drawing audiences into its performances through a creative blend of musicality, acting and staging, originated when Flickers Arts Collaborative brought soprano Julibeth Andrews, tenor Eric Bronner, and pianist Nancy Nicholson together for a concert in 1993. They have been performing together ever since. "Music for a While" is known for its versatility, with a repertoire ranging from classical art songs to Broadway hits, to gems of the concert piano literature, to music by contemporary avant garde composers. "Music for a While" is often joined by musician colleagues for unique programming such as "East Meets West," which features arts songs of Ikuma Dan, and "Christmas Canticles," a celebration of the nativity through songs and readings. "Music for a While" has been featured in music series at museums, mansions, colleges, festivals, and churches throughout Rhode Island and New England including RISD Art Museum, Blithewold Mansion, Linden Place Mansion, Brown University's Bell Art Gallery, Christmas in Newport, the Jubilé Franco-Americain, and Salve Regina University, to name a few. Julibeth Andrews, soprano—of Jamestown, is a singer and teacher in demand. She has appeared with the Sierra String Quartet in San Francisco. With Chicago's Mostly Music Inc., she sang in many premieres and performed in a national broadcast. Local audiences have heard her perform roles with Ocean State Light Opera, and solos with Swanhurst Chorus. In 1992 she was chosen to sing for Sherrill Milnes at the National Association of Teachers of Singing Conference. In 1994 she was a finalist in the Chloe Owen American Art Song Competition. In 1998 she received the Goldovsky Fellowship for opera direction from the National Opera Association. With a Master of Music degree from URI, she teaches voice and performance technique at Salve Regina University, Roger Williams University, and in her private studio, VoiceImages. She also directs for the CBC Players. Eric Bronner, tenor—of Newport, performs regionally, nationally and abroad. He has been hired for the June 2002 Napa (CA) Zarzuela Festival. Last summer he sang concerts in Dayton, OH, and Louisville, KY. In June 2000, he was a soloist at the Aldeburgh Music Festival in England. He is a regular soloist with American Classics in Boston, and has sung roles with Longwood Opera (Boston) and Ocean State Light Opera. He pursued his Master of Music degree on scholarship at Longy School of Music in Cambridge, Mass. He teaches voice at the RI Philharmonic's Music School and the Wheeler School and serves as musical director for Flickers. For the past two years, he received the Cirino Arts Education Fellowship from the RI Foundation. Last June, he was selected for the prestigious professional teachers internship of the National Association of Teachers of Singing. Nancy Nicholson, piano—of Providence, has appeared as piano soloist regionally, nationally, and abroad at Royal Festival Hall's Purcell Room (London), and at the Salle Cortot and Schola Cantorum (Paris). A specialist in French music, her second place performance at the prestigious French Piano Institute won her a concert at the French Embassy in Washington, D.C. She performed as soloist with the Cape Cod Symphony and in the Concerts on the Island series in Newport. She has played with various chamber ensembles and was a founding member of the Cape Chamber Players. With a Master of Music degree from the University of Wisconsin, she teaches privately and has served on the faculties of Notre Dame University (Philippines), Cape Cod Conservatory, Cape Cod Community College, and Wheeler School. Saturday, May 22, 8 p.m.
Tin Pan Alley Classics," . A nostalgic journey back to when ragtime and jazz meet Broadway in great works that are now a treasured part of the American Songbook. "Music for a While"soprano Julibeth Andrews, tenor Eric Bronner, and pianist Nancy Nicholson,are joined by acclaimed Boston Cabaret Duo Ben Sears and Brad Connor. Saturday, July 17, 8 p.m.
"Land of the Midnight Sun," A summer solstice concert of charming music from the NorthSweden, Norway, Finland, Denmark. Music for voice, piano and violin by Grieg, Sibelius, Palmgren, Nielsen, and Kilpinen, featuring guest artists soprano Kara Lund and violinist Laura Gulley, with "Music for a While." Concerts of the Jamestown Chamber Music Series were held at Central Baptist Church, 99 Narragansett Avenue, Jamestown, R.I.
Sunday, February 2, 3:00 p.m.
Charming, amusing, and beautiful chamber music featuring Schubert's Shepherd on the Rock and Poulenc's playful piano-wind sextet, performed by the Northeast Quintet with Music for a While. St. Matthew's Episcopal Church, 87 Narragansett Ave., Jamestown, R.I.
Sunday, March 23, 3:00 p.m. Sweeping, romantic, and emotionally stirring chamber music featuring Borodin's String Quartet in D Major, Beethoven's Piano Trio in C Minor, and Italian arias for voices and strings, performed by the Providence Quartet with Music for a While. Central Baptist Church, 99 Narragansett Ave., Jamestown, R.I.
Saturday, May 31, 8:00 p.m. Entertaining and heart-warming selections from Broadway's best including Kismet, On the Town, She Loves Me, A Little Night Music and more, performed by Roberta Janelle, mezzo soprano, and Frank Ward, baritone, with Music for a While.